When someone turns away, with his/her back to you, without a word, you might find it difficult to reconnect with that person. Even if it is not a hostile gesture, just an awkward lapse in conversation or meeting, you have to search for effective, proper words to recapture the person’s attention. Then, it is all the more difficult if the person is shutting down all the external interaction, retreating into the personal void. We have seen a couple of instances of Ryouhei turning his back to “us/camera/father” to express/suppress his painful disappointment. Sometimes, he just loses his gaze into nowhere, his mind filled with anguish. The death of his father completely shatters any hope of his family rebuilt on this earth. This time, we realize, he turned his back to us, to the world. He stands alone in the hospital’s hall, speechless when Hirata approaches him and tries to console him. We only see his back, probably crying. This motif is repeated at the last shots, in which Ryohei turns his head away from us/camera after he says his father was a good father. It is quite natural to assume that Ryohei turned away to let other not to see his tears. But I believe the implication runs much deeper. I always considered the last three shots of this film particularly fascinating and unsettling. What is the meaning of these three shots? The film practically has ended with the first train shot, making these three shots disconnected from the preceding section. First of the three shots is the Ryohei’s resistance to show his tears to Fumi, public and us. The second of the three shots is the box containing the urn of his father’s ashes. 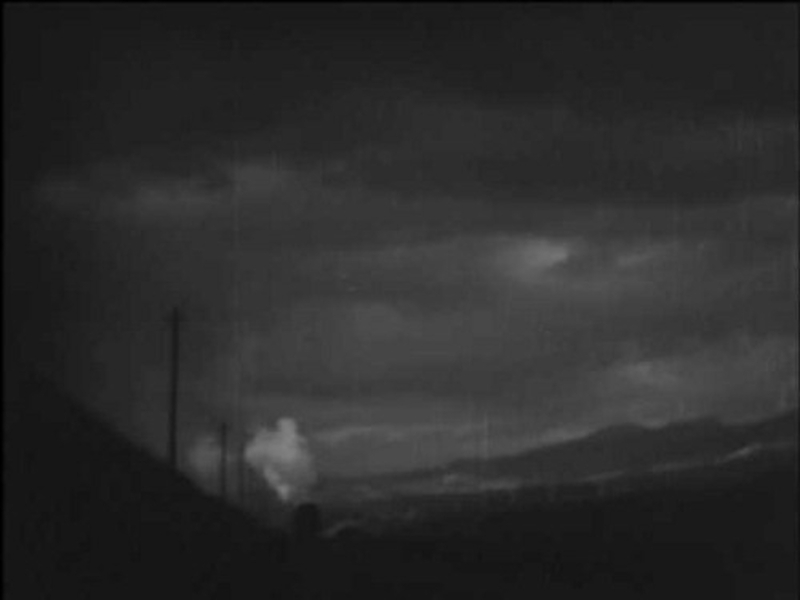 And the last shot of the train traveling into the vanishing point of barren land in the night is one of the darkest images of the film. I imagine this night shot was achieved by using a dark filter, which renders the unnatural feel, eerie landscape. The dense, thick clouds hang low, blocking and scattering the moon and heavenly light. Here the earth solidly anchors the heavy, suffocating air. These three shots can be interpreted as symbols of the time. Shutdown of communication as an individual, the death and the living hell. Conversely, one of the brightest scenes occurs earlier in this section. When the father dies in the hospital, his face was haloed by the brightest light from the exterior. This scene radiates as if the death were rejoiced and celebrated with the bright light of the other world. As we have seen, this film hovers around the border of the two world; this world of the living and the ‘other’, the world beyond. At the border, the world beyond is filled with bright light, as in the other side of the riverbank, while the world of ours is filled darkly with the graves and ashes. The time was that of violence and blood. Ozu had seen the hell in the war field, and survived. The whole nation was in the state of hyperactive numb, not able to question their own actions anymore, but only to continue on with the self-destructive killings. Living (not dying) in the world filled with horror and atrocities is hell. In such a world, the death can be sweet blessing. But you might ask, is this really Ozu’s own intention? I do ask the question myself. This should be a story of the father and the son, whose lives were separated, and during its course, their honest soul-searching has shaped itself. I believe that was all there was. On surface, the narrative does not explore the sweetness of death nor pain of living. It is more probable that Ozu didn’t intend any of this, but the shrapnel of violence exterior to the film pierces through the soft skin of fictional lives of the father and the son. It wasn’t avoidable. Collective psyche of the time was abnormal at best. It was the time when adults told their children to die, die heroically. In such a defunct world, the death must have given off the sweet smell, while surviving was painful torture with no end in sight.